During this century, Europe is facing the transition towards a low-carbon energy system based on technological development, leverage of vast domestic untapped renewable resources and innovation of the industrial capabilities. As a result, there is a need to diversify and increase the amount of energy obtained from renewable sources, as stated by the Directive 2001/77/EC on the promotion of electricity produced from renewable energy sources in the internal European market. 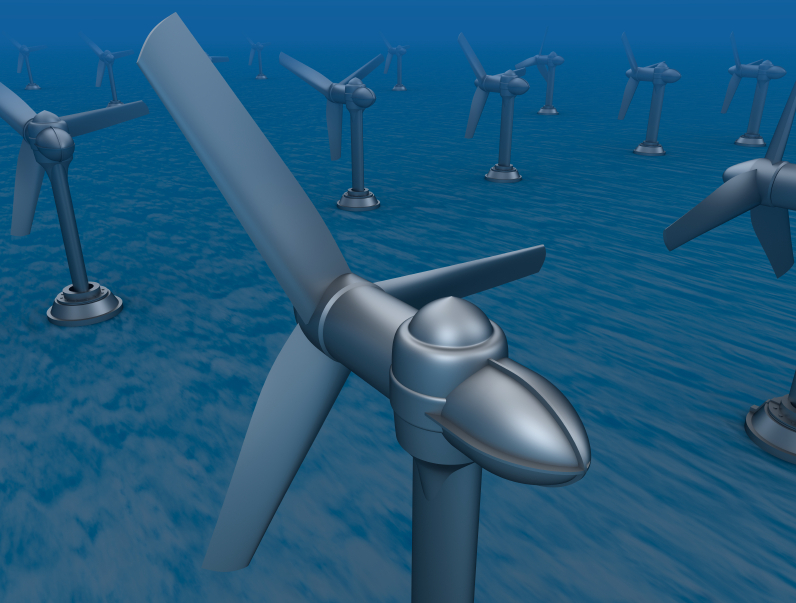 Within this framework, marine renewable energies are currently being paid particular attention due to new technological advances, high potential resources of energy in the ocean (e.g. waves, tides etc.) and in-land spatial limitations. Indeed, spatial limitations that effect on-land commissioning of renewable energy harnessing devices (both solar and wind energies) have promoted studies on the energetic capabilities of the marine environment, either using mature technologies (wind or tidal barrage) or developing new technologies in a longer term, such as harnessing marine energy from waves, currents or ocean temperature. With the United Kingdom leading the development effort, ocean energy potential has been investigated in many research and development projects, available from several sources from all across the EU (e.g. SOWFIA Project; TETHYS database; the Ocean Energy Systems Technology Collaboration Programme, OES; the European Atlas of the Seas; the Marine Renewable Energy World Map; the Marine and Hydrokinetic Technology Database; the Crown Estate ; the UK Marine Energy Database, UKMED; the European Marine Energy Centre, EMEC; the Marine Scotland Interactive resource; the Falmouth Bay Test Site). However, the available information on ocean energy projects (e.g. location, project status) is not always the same in each of these sources. Therefore, the EMODnet Human Activities Team has faced the challenge of reviewing, aggregating and harmonising all this available information in order to release an updated dataset. In addition, since one of the development stages for ocean energy conversion systems is sea testing, some open-sea testing sites have been established in the recent years to provide developers of ocean energy converters (mainly wave and tidal energy converters), areas for testing their devices in real sea conditions. 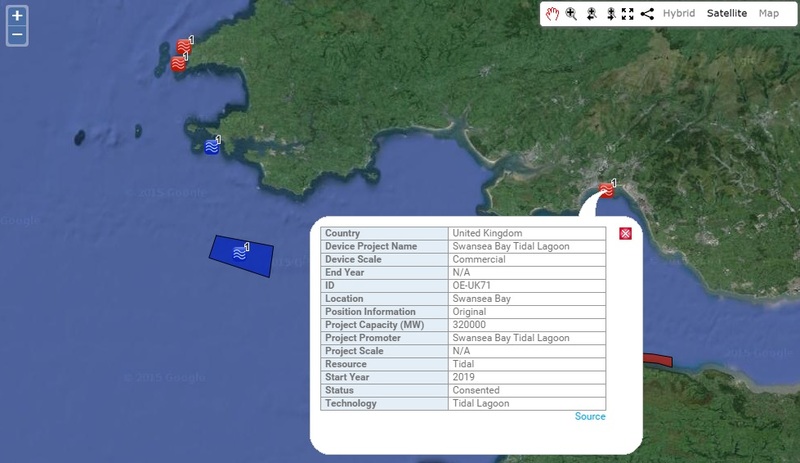 Therefore, the updated dataset on Ocean Energy, available now for viewing and free download, comprises of ocean energy facilities (projects and test sites) in the EU, with the respective location and distribution on a map. Unfortunately, data from the Central and Eastern Mediterranean Sea and from the Black Sea are currently not available through our dataset. Point locations – representing sites where ocean energy projects have been undergone or currently are at different stage of development (e.g. in planning, in construction, operational). Areas – representing open sea testing facilities. Clicking on an individual feature on the map will open a dialogue box with information about the location (e.g. project/test site name, location, country, sea basin, resource type, starting year, ending year), as well as a link to the sources. 4 Responses to "Exploiting the Ocean’s Energy"
This is a good site for overview. For Norway, an update is needed for the Runde testsite on the W coast. Seabased ended their tests here in 2012, now we have Waves4power here, they deployed their WEC in January 2016 at the site. I can provide more facts if you want. 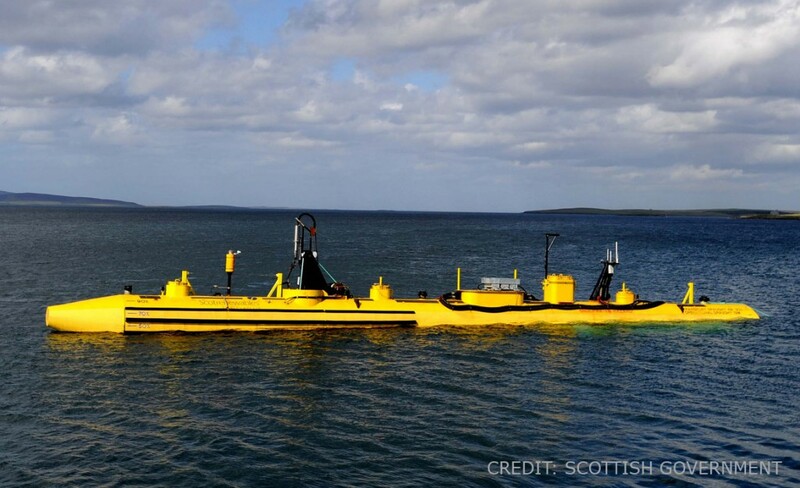 Several ocean energy projects are also underway or under preparation in several French regions, especially in Normandy where two tidal pilot farms will be installed in the next few years. For more information, do not hesitate to contact me. Thank you very much for the updated information! Of course, in order to improve the available dataset we’ll be pleased to receive the facts you can provide us. If you have supplied an e-mail address we will endeavour to get in contact. Alternatively, you can supply contact information and send files using the ‘Submit Data’ page. But how much of the ocean ’ s energy can be exploited in the United States is open to speculation, Bedard says. The technology is still immature and does not have nearly as much support from the government as solar and wind power do.